Mobil Steel International, Inc. is a 50 year old steel fabricator located in Houston, Texas that fabricates a wide range of steel products for the world’s essential industries. Mobil Steel partners with contractor and engineering firms to meet owner and contractor requirements for projects in the petrochemical, manufacturing, oil & gas drilling, and shale gas drilling, as well as communication, clean fuels, and power utilities industries. Mobil Steel qualifies to be included in essential industrial and commercial bid lists within the industry. Mobil Steel’s South Wayside facility in Houston has production capacity of more than 1,000 tons per month within its 80,000 square feet of plant facilities under roof. The 8.5-acre site is located within major freeway access to the refining and petrochemical complex in Harris and Galveston counties, and is in close proximity to the largest U.S. steel import/export seaport – Port Houston. Mobil Steel is certified by the American Institute of Steel Construction (AISC), one of only a few Houston area fabricators to maintain the strict requirements of the AISC Certification Program for more than a decade. 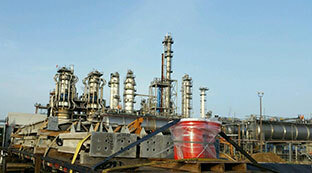 AISC quality certification ensures that Mobil Steel is among the best steel fabricators in Houston. As a quality-certified member of AISC and an affiliate company member of the American Welding Society, Mobil Steel represents the highest standards in the steel fabrication industry and strives to be the best steel fabricator in Houston. Our goal is to provide the highest quality, reliable and on-time delivery that meets or exceeds customer, industry and contractual expectations as we deliver quality steel fabrication on projects throughout the world. Mobil Steel is a member of many organizations and associations that promote excellence, responsible business practices and adherence to the highest standards in our industry. We are a quality-certified member of AISC, a member of the Association of Chemical Industry of Texas, active with the Associated Builders and Contractors on the national, state and local levels, and a member of the Associated General Contractors of America, all groups that demonstrate best industry practices. We work with the Economic Alliance Houston Port Region and the Pearland and Pasadena Chambers of Commerce to promote healthy economies and business leadership. Mobil Steel has met the certification as a small business through the U.S. government’s Small Business Administration program and Mobil Steel engages HUB, minority-owned and women-owned businesses as vendor partners. Mobil Steel is a registered member in good standing with Dun & Bradstreet. 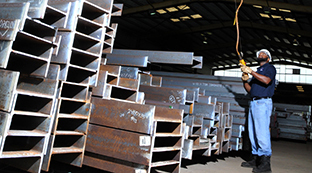 Mobil Steel is a full service steel fabricator offering everything needed for timely delivery of quality structural steel to the project jobsite. From our estimating department calculating both lump sum and unit pricing, to our project management department setting up production schedules, the entire Mobil Steel team is focused on what it takes to compete in the global market place – Reliable Service, Flexible Capacity, and Quality Service along with Sustainable Performance! Certified member of the American Institute of Steel Construction (AISC). All detail drawings for shop fabrication are prepared per AISC codes and recommendations using SDS/2 by Design Data, or client’s preferred design software. Mobil Steel utilizes a pool of companies from the National Institute of Steel Detailers. Design Engineers’ drawings, specifications and standards are used to produce high quality shop and erection drawings that meet all customer requirements. Mobil Steel Safety, Quality Assurance and Quality Control Programs verify that all client specifications and requirements are met and that all industry codes and standards are followed during the fabrication processes. Only companies meeting the highest quality standards of Mobil Steel are used for galvanizing and painting processes. 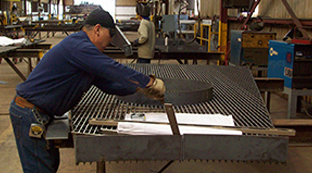 Our vendor team of companies have proven to be reliable and dedicated to quality during many years of service to Mobil Steel. Mobil Steel is proud to have earned a silver designation in the Safety Training Evaluation Process (STEP) program sponsored by the Associated Builders and Contractors Greater Houston Chapter. The STEP program helps ABC members develop and continuously improve safety and training efforts that ensure worker well-being and health. The ABC STEP program uses 20 key components to safety and health, as well as Occupational Safety and Health Administration (OSHA) standards and reporting requirements to evaluate members’ safety and health performance. A self-evaluation of Mobil Steel’s safety and health program confirmed that the local steel fabricator meets guidelines of the ABC STEP program and demonstrated Mobil Steel’s commitment to safety and health through development and analysis of structured safety and loss prevention programs, and training to reinforce safety programs.